So what is a varangian legguard? Let’s play stupid for a second and look to our left: That, my friends, is a varangian legguard. This item is a couple of steel strips, riveted to leather bands and used by early medieval reenactors – „vikings“ – as a protection for the lower arms or legs. 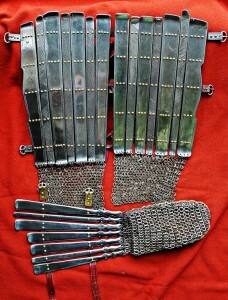 Several vendors stock these – mostly called „Varangian legguards“ or similar; the case to the left, though, minted the slightly more neutral name „viking legguards“. 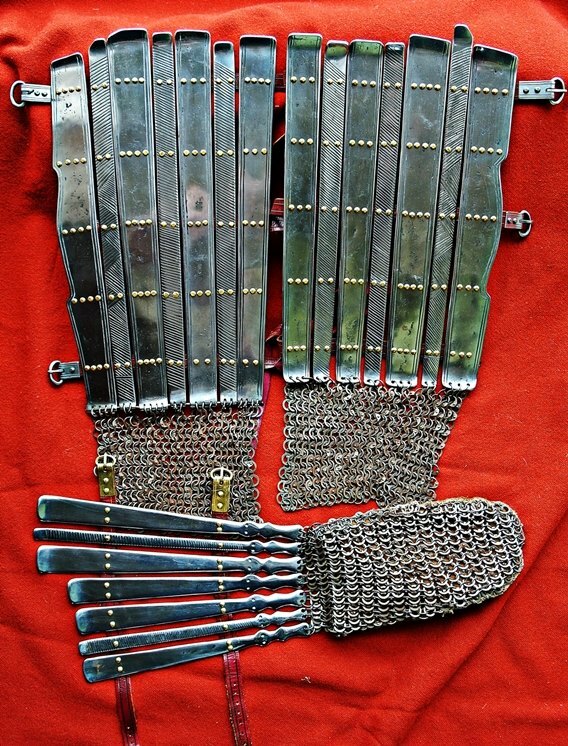 Practical for fighting, especially in huscarl environments, but…authentic for northerners from the 8th to 11th centuries? Let’s check. Looking at armour finds from the northern european early medieval age, post migration, one starts to gently weep. There’s a lot of vendel stuff, but for us „vikings“, there’s preciously little choice to armour up based on finds. Not even mentioning leather armour or acetons, iron or steel armour is almost absent from finds, too. Armouring one’s legs and arms is even impossible just looking from the find perspective, at least for the viking age (I’m using Lindisfarne till Hastings as a timeframe). There are, however, arm and leg guards from Valsgärde, grave 8. This is a vendel age grave (the Valsgärde locality is very close to Gamla Uppsala and Vendel, half an hour by car from Stockholm), created long before the „viking age“. The metal strips found there, including maille remains, were first interpreted as torso armour, then revised to arm and leg armour. Especially the latter don’t make so much sense for infantry fighters and were probably cavalry equipment, but the shin-damaged modern huscarl fighter might try to avoid this notion and still yearn for them. Be aware though: The Valsgärde armour is not from the viking age! Disregarding it, there’s not a lot more to mention. Not to say, next to nothing. Another often-quoted source is a number of pictorial representations of leg armour. 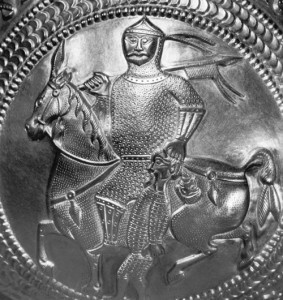 One of them is a rock carving of Goliath which might wear something like leg guards (I’ll skip that because it’s somewhere in the middle east), and there’s a silver bowl, found in today’s Romania, showing a mounted warrior (an Awar, a mounted steppe warrior, thanks to Michael Maa for the clarification). You can see a scaled down image to the left. The time period is okay (we guess), but is this the sort of warrior that „vikings“ or „varangians“ had to deal with a lot? Not really, I think. (Varangians, by the way, are „members of the byzantine varangian guard“ in this article, not „members of the diffuse predecessor of the Rus). Let’s play devil’s advocate and construe a connection between the Khazars and byzantine vassals. Let’s also play the „they weren’t stupid“ card. Still, are those facts? Not really. The byzantine military manuals (which I unfortunately cannot currently quote firsthand, so I have to rely on secondary sources here) don’t seem to mention leg and arm armour, although this is often insinuated. (Source: Peter Beatson’s limb armour article). The idea that Varangians wore those leg and arm guards in the Emperor’s duty and made them „known again“ in Scandinavia afterwards, doesn’t seem to be a plausible train of thought, then. It was probably not customary to take home your empire-issued armour after duty, let alone leaving said duty to return home early. Facts are one thing. How does a… well, dodgy piece of kit accomplish the feat of turning a part of so many reenactors‘ equipment and never rais any doubt given it’s questionable provenance? This is where secondary literature comes into play. Looking for the culprit, you can find the book „Die Wikinger“ by T. Verhülsdonk et al. (english title should be „The Vikings“) a picture of a „Varangian Guard“ with detailed explanation, including detailed pics of arm and leg guards. These pictures were taken sometime before 1997, when the first edition of that book came out, and show reenactors. We have to conclude that the varangian legguard must have been an „accepted truth“ back then – the source of the myth must be otherwise. So let’s look over the channel to Great Britain and check popular military history books there. The famed/notorious Osprey books show Varangian Warriors of the tenth century AD in „Byzantine Armies“, 1st ed. 1979. The sparse explanations for that plate doesn’t mention the war, err, a source – seems Osprey took to hearsay in this case, instead of looking at actual finds. At this point, the myth is older than me who tries to hunt it down. And still, a couple of years are to go. 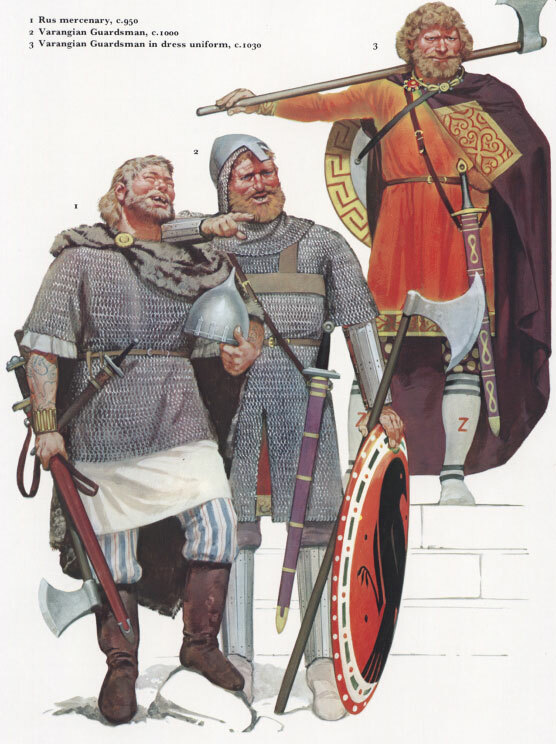 The oldest picture of „Varangian Legguards“ I could find is from three years before the Osprey book saw light, and it’s also by Ian Heath. This is a simple line drawing in „Armies of the Dark Ages“, a role-playing supplement (I hope I caught the spirit of this book). And here’s me presenting to you the source of the reenactor myth of the Varangian Legguard: A black-and-white warrior from 1976. There are no viking-age finds, nor pictures from the correct time and locality which prove „Varangian Legguards“ or „Varangian Armguards“. 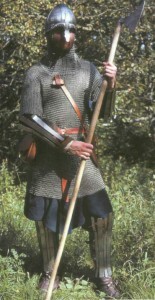 They do not belong into a scandinavian or anglo-saxon viking-age kit which aims at authenticity on the battlefield. Not even if you portray a „Varangian“. If you want to wear them for practical reasons, by all means do. But please don’t try to construe a historical context which is only there in role-playing literature. Dieser Eintrag wurde veröffentlicht in Uncategorized von arnulf. Permanenter Link des Eintrags.